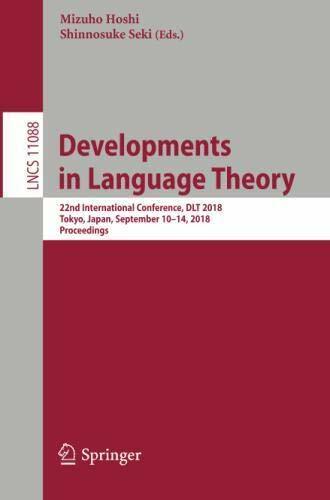 This book constitutes the proceedings of the 22nd International Conference on Developments in Language Theory, DLT 2018, held in Tokyo, Japan, in September 2018. The 39 full papers presented in this volume were carefully reviewed and selected from 84 submissions. The papers cover the following topics and areas: combinatorial and algebraic properties of words and languages; grammars, acceptors and transducers for strings, trees, graphics, arrays; algebraic theories for automata and languages; codes; efficient text algorithms; symbolic dynamics; decision problems; relationships to complexity theory and logic; picture description and analysis, polyominoes and bidimensional patterns; cryptography; concurrency; celluar automata; bio-inspired computing; quantum computing.